In a literally explosive episode of AMC's The Walking Dead, we finally learned the fate of Andrew Lincoln's character, Rick Grimes, who fans have been preparing to see die since it was announced earlier this year season nine would be his last. However, the way things went down in season nine, episode five was a shock — and what's coming next is absolutely huge. Spoilers ahead for The Walking Dead season nine, episode five, "What Comes After." When he blew up the bridge he built to prevent a hoard of zombies from descending on his family and friends, Rick Grimes appeared to die in the explosion. However, he was actually thrown from the bridge and survived — only to be found by former foe and current friend Jadis (Pollyanna McIntosh). Jadis immediately radioed the mysterious helicopter that's been appearing sporadically throughout The Walking Dead, and we learned Rick would survive as he was whisked off in the helicopter to parts unknown. Then, in a wholly unexpected turn of events, the episode took the series through yet another time jump, leaving us to wonder if Rick actually lived or died. Well, thanks to a lengthy interview with The Hollywood Reporter published on Sunday, Lincoln revealed he and former showrunner Scott M. Gimple hatched a diabolical plan for his exit from the series as far back as season four — and yes, it involves a whole lotta Rick Grimes. The outlet revealed Rick lives on and will appear in three feature-length TV movies written by Gimple. The movies will begin production in 2019. This news is huge, not only because it means what was assumed to be a major character death is something else entirely, but because these films will expand The Walking Dead universe in a big way. "There were many iterations of the story and it became rather late last year that this [came together] because it was a pipe dream," Lincoln told THR. "I said, 'Wouldn't it be nice to do this.' It's never been done by a cable TV channel and I didn't think it would come to much. Quite astonishingly, at the end of last year they said let's go for it. This organically grew out from last year. There were versions [of the episode] that Rick wasn't going to make it. But thankfully it went this way!" "What Comes After" featured appearances by former cast members Jon Bernthal, Sonequa Martin-Green and the late Scott Wilson, who filmed his scenes before he died earlier this month. Lincoln said working with them was "a bit of a fever dream." After Lincoln filmed his last scene, he was presented with a photo album and had a "non-death dinner" with the cast and crew before leaving Atlanta for his home in London, which he said made him feel "very lonely." He added that he hopes Rick's exit is received well by fans: "When [showrunner] Angela Kang pitched this season to me she consciously said Rick has been many things: he's oscillated between father, husband, cuckold, antihero and cop to being submissive to Negan and prideful. We've seen so many variations of a leader. Angela wanted him to finish as a hero and I hope that's how it's taken." 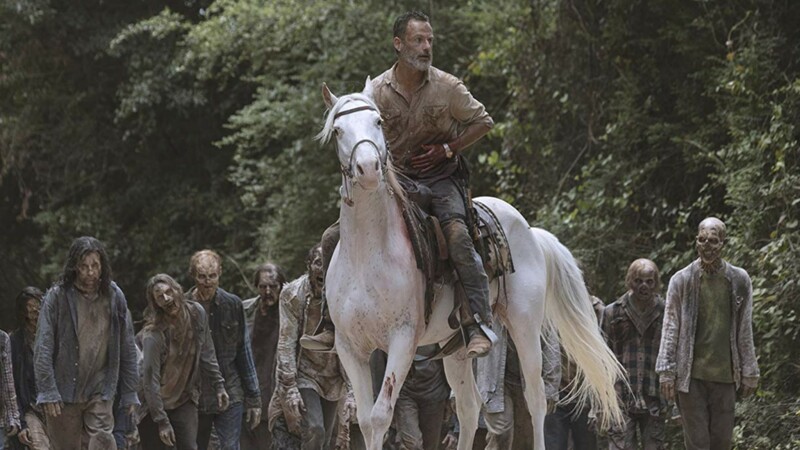 The Walking Dead has long provided viewers with shocking sequences that defy all expectations, though Rick's exit and what it implies for the future of the series may be the biggest surprise yet. Since Lincoln is scheduled to appear in all three Walking Dead films, we can't help but wonder what will happen, how it will affect the trajectory of the long-running TV series, and what else this writing team has up its collective sleeve.